April is Earth Month! Let’s kick it off with a snorkeling adventure, eco-crafts, a mini fair, and fun raffle prizes! Bring the whole family! No need to pre-register. When: Saturday, April 6 from 8am to 12pm. Free snorkeling tours will be from 8-10am. Mini Fair & Eco-crafts from 9am-12pm. FOR SNORKELERS ONLY: GNA Waivers AND PADI form are required for snorkeling participants. An adult must accompany any snorkeling participants under eighteen years old. Waiver forms will be available on site. For more info, contact Jane at 735-3981 or email jane.dia@agriculture.guam.gov or email GNAGuam@gmail.com. The entrance to 1,000 Steps, a popular hiking spot, in Mangilao is a disaster! It is a regular illegal dumping site. Let’s set a good example for the rest of the community by joining this clean-up effort. This event is hosted by GCC Eco-warriors, GW Marine Mania, UOG Green Army, GNA in partnership with the Mangilao Mayors Office. When: Saturday, March 16 from 7:00 to 11:00am. Come when you can and stay as long as you want. Where: One Thousand Steps – Mangilao. Who: Everyone on Guam. GNA Waivers needed for participants NOT in hosting groups. No pre-registration required. Waiver forms will be available on site. Be prepared: Wear sun protection, shoes highly recommended, and water bottle. For more info, call Linda at 828-7704 or email lindian@teleguam.net. Chaetomorpha algae has grown out of control in Tumon. This overgrowth can negatively impact our coral reefs and also impacts the various activities that take place in Tumon. Learn more about the issue here. This Chaetomorpha Clean Up is sponsored and hosted by the Guam Visitors Bureau in partnership with the Guam Department of Agriculture’s Division of Aquatic and Wildlife Resources. Where: Tumon – Two Check-in stations for volunteers at Ypao Beach and Matapang Beach. Who: Everyone on Guam. All participants must sign a GNA Waiver Form to participate. If under 18, parent or legal guardian must sign form if accompanying adult is not parent/ guardian. Forms will be available on site. Be Prepared: Wear sun protection and bring a reusable water bottle. Water will be available on site. Email guamfishinfo@gmail.com or call 735-0294/0281/0289 for more information. Experience Malesso’s watershed from ridge to reef (R2R) with the whole family. Free activities for all: kayak tours, river walk, snorkeling, and a mini fair. Where: Register on the day of event in the Merizo Recreation Center (white building) next to Merizo Pier Park. Who: Everyone on Guam. All participants must sign a GNA Waiver Form and PADI form (for snorkeling) to participate. If under 18, parent or legal guardian must sign form if accompanying adult is not parent/ guardian. Be Prepared: Be ready to get wet. Wear closed-toe shoes and sun protection, appropriate swimwear, and bring a reusable water bottle. Email gnaguam@gmail.com or call 646-1905 for more information. Come and join us for Earth Day at Sasa Bay! Sasa Bay Marine Preserve Area is home to extensive mangrove forests that are home to many juvenile reef species and other interesting critters. Click here to pre-register for Earth Day at Sasa Bay. April 22nd is Earth Day! Guam Nature Alliance is celebrating all month long! Celebrate our island home and the beautiful environment we all benefit from. There are lots of events to help you learn more about Guam’s native animals and plants or how you can help them. Check out the schedule below to find an Earth Month activity for you, your family, and your friends. Click here to download PDF of this calendar. Click here to pre-register for Earth Day at Sasa Bay. UPDATE: R2R Malesso’ Adventure is re-scheduled to November 19th in conjunction with Malesso’s Fiestan Tasi (Water Festival). R2R Malesso’ Adventure is NOT on November 5th. Another R2R Adventure awaits you in Malesso’! Malesso’ Annual Fiestan Tasi (Water Festival) to celebrate ocean life. GNA’s Team Tasi will take you on a snorkel tour to experience Merizo’s marine environment. Shuttle vans will transport participants to join a river tour of Geus River and kayak tour of mangrove habitat. Biologists and other GNA members will share their knowledge of these important natural resources on these interactive tours. An experience you’ll never forget! Event is free, snorkel and other safety gear, will be provided. Outrigger and Underwater World will host World Oceans Day event tomorrow from 8am-3pm in Tumon! World Oceans Day event will kick off with the Outrigger Beach Clean Up at 8am. After beach clean up, catch up with GNA’s Team Tasi at the Tasi Mini Fair from 9-11am in the Outrigger Lobby. Celebrate our ever-giving, ever-beautiful ocean tomorrow with us! Bring the whole family! The event is free and open to the public – no pre-registration required! See the schedule of tomorrow’s activities below. Two more days until our next R2R Adventure in the Pago Watershed! 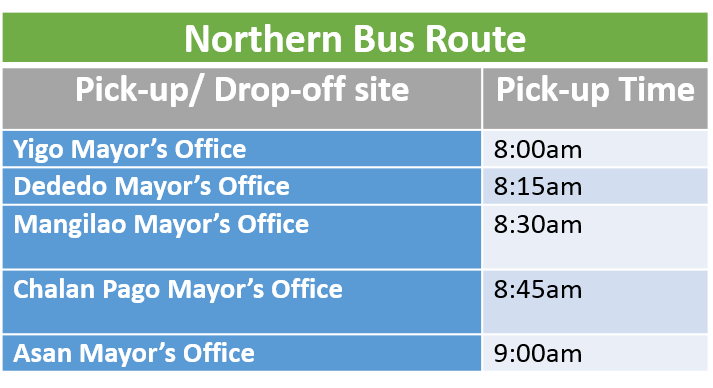 See the bus schedule below. REMINDER: If you’re under 18, you must submit your GNA waiver signed by parent/guardian and be accompanied by an adult. Note: Simon Sanchez students that turned in forms already to Mrs. Blas – this does not apply. Check out GNA’s Earth Month Calendar and Activities Listing so you, your family, and friends can show your island pride. Participate in a clean-up, go on an R2R Adventure, attend Earth Day Celebration, or all three. See the Earth Month Calendar below and Activities Listing for more details on what you’re interested in! It’s time for another Ridge-to-Reef (R2R) Adventure! On this adventure, we’ll be in the Pago Watershed. R2R Adventurers will visit two sites with GNA Tano in Leo Palace to compare and contrast the vastly different ways humans use and affect the environment. Participants will go on a kayak tour and do water quality testing of Pago River with GNA Hanom (Fresh water). Participants can help clean-up the beach site, collect data on micro-plastics, and see cultural fishing demonstrations. Bus transportation is available. Participants interested in riding the bus from village mayor’s office can sign up when pre-registering for event. Service learning credit available for students. Click here to request your teacher’s approval for credit through guamservicelearning.com. NOTE: Students still need to pre-register for event through GNA website or by phone. If you’re 18 or older, join us this Saturday, February 13 from 6-8pm at Horse and Cow in Tamuning. Get a chance to meet and socialize with scientists on Guam! Learn more about the research and field work they do, why it’s important, and how it benefits the community. Attendees can win small raffle prizes too! Who knows? Maybe you’ll even find yourself an opportunity to volunteer to learn more about different science subjects, such as marine biology, botany, biology, and chemistry for cancer research. Click here to get sneak preview of the scientists that will be there! Please click on the image to go to the Event Registration page to sign up for a free bus ride to the event and download required waivers.